Laparoscopy enables surgeons to perform the same procedures as in traditional open surgery, using small incisions (keyhole surgery) as opposed to large abdominal openings. Medical experts revealed that there are numerous benefits of performing laparoscopic surgery over traditional surgery, which is performed through big incisions. In Laparoscopy surgery, patients experience less discomfort and have less post-operative pain as compared to traditional open surgery. With Laparoscopy, patients manage themselves well such as they are able to get up and walk around faster and get back to their regular activities earlier. In traditional open surgery, patients have more restrictions to do their activities when they are discharged from hospital in order to prevent developing a hernia at the incision spot. Though, medical conditional, hernias rarely develop at incision sites, but still patients have to take health precautions with large incisions. Patients who opt laparoscopy surgery have less chances to develop wound infections because the incisions are minor. There is also less exposure of internal organs to possible external contaminants thereby reduced risk of acquiring infections. In this procedure, patients can be able to manage routine activities soon, they are less likely to develop blood clots or pneumonia which may develop with traditional surgery. Patients undergoing bowel surgery can drink and eat earlier as compared to procedure used in the past. After the laparoscopy surgery, incisions have healed the scars which are almost undetectable therefore patients become comfortable and do not feel self-conscious. Currently, in laparoscopy surgery, many procedures are performed on an outpatient basis or with only an overnight stay. For example, gallbladder removal used to be performed through a six-to-eight inch incision. Afterwards patients would often have a tube through their nose into their stomach until the next morning and would be in the hospital for four or five days. With laparoscopic surgery, there is reduced haemorrhaging, which decreases the chance of a blood transfusion. Although procedure times are usually slightly longer and often with a same day discharge which leads to faster return to normal life. In general, laparoscopy surgery saves a patient big incision, the dividing of abdominal wall muscles and affords a much more rapid recovery. 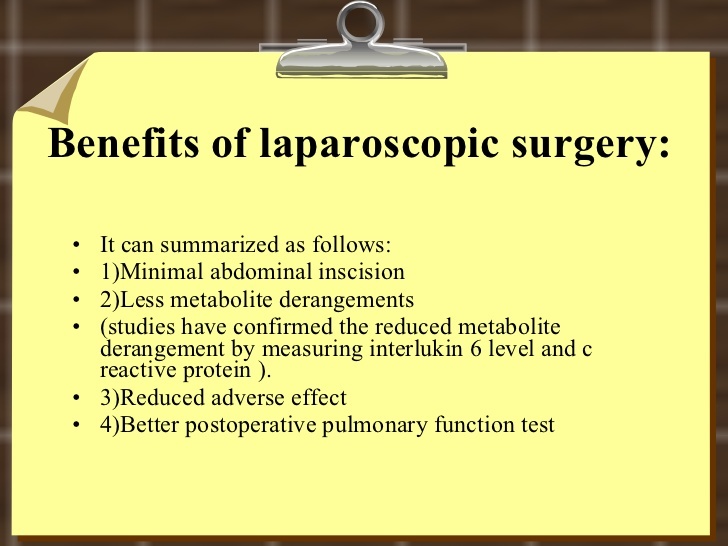 It is well understood that laparoscopic surgery has become a definite alternative to open surgery for medical ailment. Laparoscopy surgery in adult age group is generally accepted. Presently, laparoscopic surgery is preferred by both surgeons and patients due to its less invasive nature. It is advantageous to patients as new instruments are constantly being developed in laparoscopic surgery together with novel procedures.